The city’s latest plan for the Milwaukee Avenue corridor in Wicker Park includes a strategy that I’ve long thought would make this high-bike-traffic corridor safer without requiring the removal of dozens of car parking spots. Yesterday the Chicago Department of Transportation announced that they intend to striped “dashed bike lanes” on Milwaukee between Division and North, a stretch where there’s not enough street width for conventional bike lanes and two parking lanes. The department plans to start construction of the lanes and other near-term improvements to the corridor next week, with the work wrapping up within two weeks. The dashed bike lanes will generally function like conventional bike lanes, with the stripe on the left side of the five-foot-wide lane being dashed rather than solid. Bicyclists will use the dashed lanes just like regular bike lanes. Car drivers will generally stay within the nine-foot-wide travel lane, only entering the bike lane when necessary, and yielding to cyclists when doing so. CDOT expects that drivers of trucks and buses will occupy part of the bike lane, but they will be required to move to the left to leave at least three feet of space when passing people on bikes. We’re likely to hear some grumbling from both cyclists and drivers over the new configuration, especially while people get used to this novel road treatment. But, since it looks like stripping all the parking from one side of the street to make room for full bike lanes is currently a non-starter from a political standpoint, this seems like a good compromise. Bike riders will tend to get more room to maneuver – important on a corridor that has seen a dooring epidemic in recent years. And while the idea that large vehicles will be occupying the bike lane at times may seem a little unnerving, the fact that motorized traffic on congested Milwaukee generally moves at a moderate speed makes it less likely that there will be dangerous conflicts. CDOT plans to evaluate the effectiveness of the dashed bike lanes by surveying users and monitoring lane positions, vehicle speeds, and crashes. I predict that the number of collisions will decrease under the new set-up, partly because having a more robust bikeway on this section of Milwaukee (currently there are just bike-and-chevron “sharrow” symbols) will raise awareness of cyclists on the road. Other near-term improvements that should be added in the next couple of weeks on Milwaukee include a mix of dashed and conventional bike lanes between North and Western, the removal of slip lanes at Division/Ashland and North/Damen, construction of paint-and-post bumpouts at several intersections, and new green-painted bike boxes at North/Damen. 20 mph speed limit signs will also be installed along the corridor and bus stops will be relocated and consolidated.Here’s a full rundown of the plans. The funding for the $235,000 project is coming from Divvy revenue. CDOT plans to add two additional crosswalks to the six-way North/Damen junction next year. Kudos to CDOT for piloting the dashed bike lane treatment on Milwaukee instead of making cyclists wait years for new bikeways. I’m looking forward to seeing how the “Hipster Highway” operates after these changes are made – it should be a noticeable improvement. “A five-foot bike lane provides sufficient room for staying out of the way of car doors” is absolutely, totally wrong. I just measured the door on my little compact four-door hatchback; it opens 38″ wide, and larger two-door vehicles open much wider. Many bikes have handlebars about two feet wide. That’s an incredibly optimistic statement. So they gave it a new name because it doesn’t meet the standards they wrote. There are a lot of times when bicyclists are the fastest traffic on this segment of Milwaukee. I’m not opposed to on street infrastructure if it gives cyclists a good place to ride. This design carves out a narrow sliver of road and designates it as where cyclists should be. It enforces the idea that cyclists should ride in the worst part of the street and stay in “their” place. Well, like I said, your bias is showing–plainly you don’t understand vehicular cycling principles. When I ride a bike I “dress for the destination” too–and find mid-lane 10 mph (or less!) pace comfortable and easy with very rare problems from other traffic. There is a lot of good on-street bike infrastructure that doesn’t involve riding in the middle of the lane and that puts cyclists in a better position for their safety. But what is illustrated here is not one of those. 5 feet width might leave a little room at the left side to avoid an opened door, but, then, what is the point of the rest of the lane where that room is not left? If you want to define a safe space to ride, don’t put a “lane” in a danger zone. That doesn’t help — while striping a buffer zone between the parked cars and the “bike lane” does help. “Religion” comes in where one thinks a bit of paint makes one safe even where the paint directs a cyclist to ride where it is proven to be more dangerous. https://www.youtube.com/watch?v=FPA-ZcYGT94 Really great. Thanks, Frank. This post should not have given rise to a vehicular vs. non-vehicular cyclist debate. What is CDOT’s rationale for dashing these 5ft lanes, as opposed to having a solid lane. As I said in my earlier post, the design presented here does NOT constitute or represent “Advisory Bike Lanes” — please see the links I provided. My lead question was not rhetorical. Can someone from CDOT or J. Greenfield perhaps answer. Thanks. “What is CDOT’s rationale for dashing these 5ft lanes, as opposed to having a solid lane.” Trucks and buses are generally too wide for 9′ lanes, so their drivers need to be able to cross the dashed left line of the bike space when cyclists are not present. I rode in it this morning, it’s partly painted. It’s very much 100% in the door zone and I felt I was close passed even more than normal. The 5′ width of the dashed bike lane will be the same as most conventional bike lanes in Chicago. Has the parking line been striped yet? If not, some people may still be parking too far from the curb, which would increase the risk of dooring. The average number of daily motor vehicle trips on this stretch is considered too high for advisory bike lanes. They will likely be tried in lower-traffic locations in the near future. Hmm… I would like to know the (true) average motor vehicle speed in this segment of Milwaukee Ave. during (extended) rush hour times. I am sure pretty that, given the 6-corner intersections, the average speed of motorists is slower than the average travel speeds of most cyclists — even relatively slow ones! Maybe the truth is: when motor vehicle traffic is heavy in both directions cars moving around cyclists who’ve taken the lane is not even an option. In fact, cyclists who “take the lane” (and stay there) at these times of day (i.e. heavy traffic times) are delaying themselves more than they are delaying the motorists! I myself move into center of lane when traffic is moving (at, I’d estimate, an average of 5-8 mph); then when it stops / is backed up, I ride slowly and very alertly along the side of the stopped traffic, in between the bumper-to-bumper traffic and the parked cars. When traffic is lighter (at off-hours), then a car can relatively easily and quickly find a safe opportunity for passing any cyclists who are “taking the lane.” Any thoughts? I guess, since the City is using dashed lines to define the “bike lanes,” they could have placed these dashed lines, say, a foot further out, making 6ft. “bike lanes” … though, it must be said, there is not much precedent for 8ft. travel lanes. If the city could have found the courage to try a true Advisory Bicycle Lane configuration (with no center line) here on Milwaukee — even though the ADT is technically too high for this facility type — that would have been a courageous and bold move, and might in fact, like other courageous and bold moves that we’ve seen Chicago and other bicycle-friendly cities make, have actually worked! Holland — at least Amsterdam — has Advisory Bicycle Lanes on roads with ADT much higher than 6000. Of course any bike lane (5′, 6′, 8′, whatever) without a buffer space to encourage cyclists to stay out of the door zone would increase the risk of dooring. The parking line was installed as well as some of the painted bumpouts. I’ll see again on the way home. Maybe I just don’t ride in very many of the ‘conventional’ bike lanes anymore. 2006 count on Milwaukee just south of Division was NB: 6700 / SB: 7100. A bike counter is supposed to be going in there, will be curious to see how that shakes out. There are A LOT of bikes on Milwaukee. A lot of them have been upgraded to buffered lanes in recent years, and the city generally doesn’t put in conventional bike lanes any more when there is room for striping buffers. Because cyclists who aren’t aren’t experienced enough to know that it’s unsafe to ride too close to parked cars would ride *farther* away from the parking lane if there was no bike lane striped? In reality, less experienced/confident cyclists tend to err on the side of hugging the parking lane because they’re afraid of being struck by moving vehicles. There’s no way these kind of riders are going to feel comfortable riding in the center of the travel lane. Having a bike lane to encourage motorists to drive closer to the center line leaves more breathing room for cyclists, which encourages less confident riders to bike farther away from parked cars. This decreases the chance of dooring. But, yes, striping a buffered space on the right side of the bike lane is a good strategy to promote proper bike lane positioning. If the cost of thermoplastic and labor was no issue, I would support striping a buffer on the outer three or four feet of every existing conventional bike lane. I.E., on a five-foot-wide bike lane, this would made it clear that only the inner foot or two of the bike lanes should be used. Well, whatever one thinks about the new design for Milwaukee Ave., one fact remains: Never ride in the door zone at speeds faster than the normal speed at which one walks/jogs (i.e. ~3 mph). This is the sage advise of international cycling guru and founder of the Chicagoland Bicycle Federation (now Active Transportation Alliance). If you ride in the door zone, you will (eventually) get doored! I recommend riding ON, or just to the left of, the 5ft. lane line at any and all times that you are cycling at a speed that would prevent you from stopping on a dime (i.e. over ~3 mph). Other thoughts / advise on safe cycling along a tight road with high parking turnover like Milwaukee Ave? Interesting POV, John. I note that your illustration has the extreme outside of the very narrow painted “safe zone” at 12′ from the curb. Compare the video illustration Frank K. gave the other day–the safe zone is at least 12.5′-15′ from the curb, according to Preston Tyree, LAB LCI. So your philosophy of the 5′ bike lane next to parking has evolved from “it’s really good–magic paint will make it easy for riders to avoid the door zone even though the whole door zone is indicated as safe and bikeable” to “actually, the striping should indicate to the rider what part of the roadway is safely bikeable.” That’s good. Now, please, note that even the extreme edge of the 5′ lane is best described as marginally bikeable and better avoided altogether. Surely, you would agree that a bike lane striping project should indicate to cyclists where it is safe to ride. There is another effect, however, of using a traffic control device, like striping, to direct traffic flow–and in this case the effect is going to be to enforce the idea that the extreme limit of where a cyclist may safely ride is 12 feet from the curb. The striping tells the cyclist “stay to the right of this line” — and thus to stay in a dangerous roadway position. This instruction doesn’t serve the cyclist there and tends to reinforce a “too far right” road position even where the roadway is not so poorly striped. The striping also tells the overtaking motorist “a cyclist to the left of this line is in violation of norms” and is too easily interpreted as ” a cyclist to the left of this line is breaking the law.” Even the experienced cyclist who would like to stay far enough away from the parked cars will be loathe to ride to the left of the line in order to be safe. In such a case, any cyclist–confident or not–is better served with no striping. A “sharrow [shared lane marker]” centered at 14′ from the curb would better indicate to cyclists and motorists alike what is the proper roadway position for a cyclist next to the parked cars. Rather than congratulating or celebrating striping such as this, bicycling advocates should be using their energy to prevent such striping in favor of truly friendly and safe facilities. Competing philosophies of cycling aside, most people riding bikes on Milwaukee prefer to stay to the right of motor vehicles. As you’ll see from the photos and video in this more recent post, the striped bike lanes seem to be doing their job to encourage driver to stay closer to the center line. That means there’s more room for cyclists ride further from parked cars, so it appears that the dashed lanes represent a modest safety improvement. Folks like yourself who prefer to ride in the center of the travel lane are still free to do so. Philosophies aside indeed! I didn’t think we were having a philosophical discussion, just one about whether the depicted striping was a good idea for the safety of cyclists. I am among the many who prefer to stay to the right of faster-moving automobiles, but of course there are times when that “right side” is the wrong side–e.g., when that side is in the “door zone.” That’s not a question of philosophy; it’s a question of relative risks. 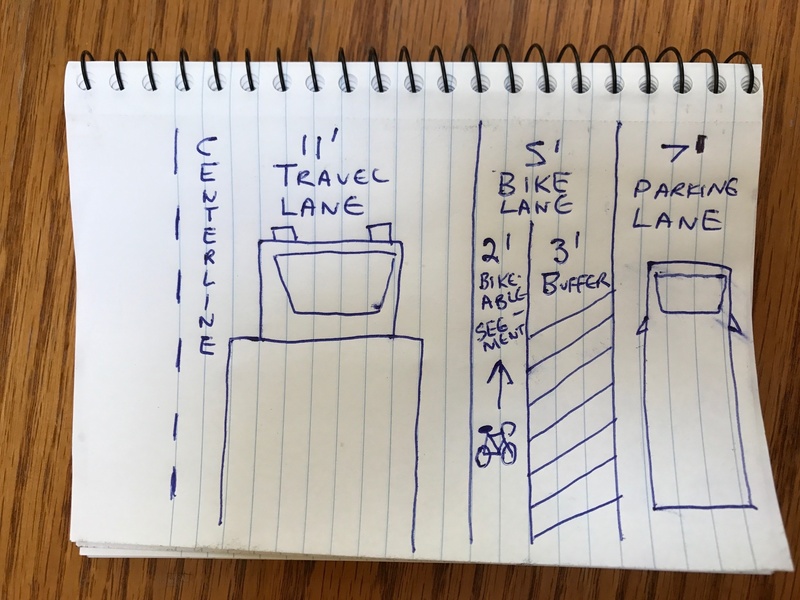 So, philosophies aside, please note that this posting http://chi.streetsblog.org/2017/08/30/eyes-on-the-street-a-first-look-at-new-dashed-bike-lanes-on-milwaukee-avenue/ is illustrated with a cyclist riding the striped “bike lane” quite within the “door zone.” This posting depicts the result we can now expect over time, for somebody, riding that facility: http://www.bikexprt.com/massfacil/cambridge/doorzone/laird1.htm Note that Dana Laird was riding to the outside of the door zone–about where you hope people will ride this dashed lane. Discussing philosophies: my philosophy of cycling facilities would include the minimum criterion that a space lined out for people to ride on be a place in the roadway safer than places not lined out for people to ride on. Your philosophy seems to be that a facility lined so to encourage people to ride in the more dangerous place on the street is preferable to leaving the street alone. Really, this is not hard. First do no harm. If you want to protect riders from the greater danger, eliminate the parking on at least one side to make proper room for a bike lane or stripe an adequate buffer between the parked cars and the shared travel lane. Reducing the speed limit to 20 or 15 mph would help that comfort level your riders are seeking. Of course I can ride on or to the right of the dashed white stripe to stay out of the door zone, but, seriously, do you expect that many people will really ride their bikes far enough away from the parked cars to be truly safer? Summary: putting bike lanes next to parking INCREASES doorings. This facility is done as if it were designed to increase doorings. http://www.bikexprt.com/massfacil/cambridge/doorzone/laird1.htm For more information on what a poor design this is–Dana Laird died with more room to avoid doors than this design allows. It already appears that car drivers are generally respecting the dashed lines.